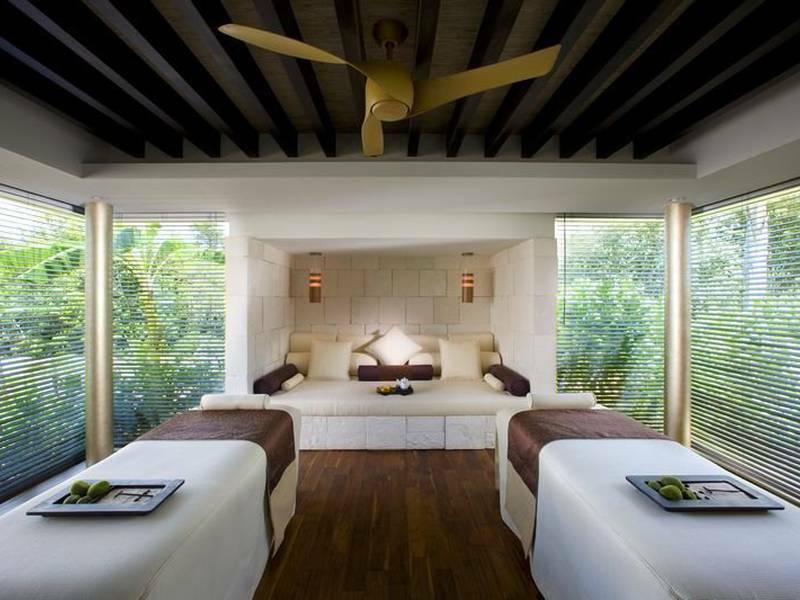 Exclusivity and luxury meet at the 5-star Blue Diamond Luxury Boutique Hotel in the Riviera Maya. 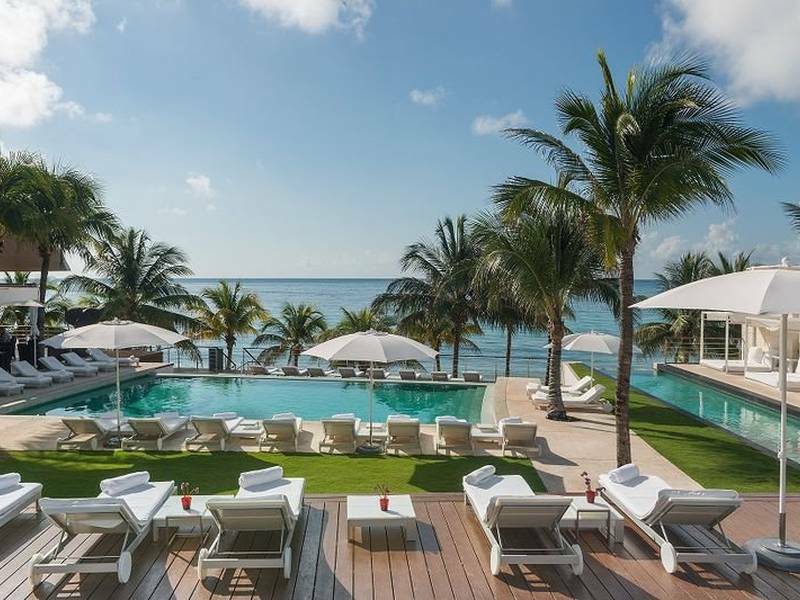 This magnificent adults only hotel is situated just ten minutes north of Playa del Carmen, amongst 36 acres of lush tropical jungle, stunning gardens and palm filled sandy beaches. 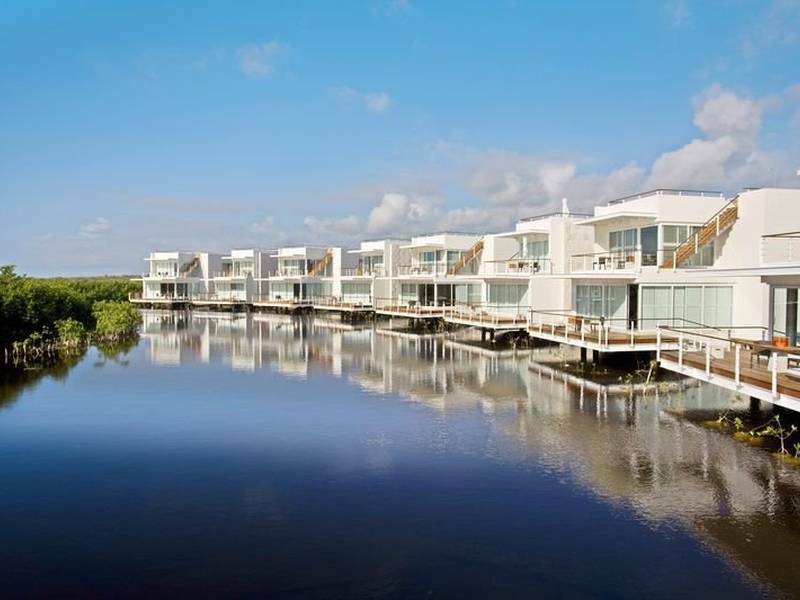 Intertwined amongst peaceful river waterways, a mystical Mayan Cenote and the crystal-clear waters of the Caribbean, the elegance of the hotel will surround you. Flavors from all over the world can be enjoyed at one of the many fine restaurants at the Blue Diamond Luxury Boutique Hotel. The hotel’s remarkable all-inclusive package offers more than just culinary options. An airport shuttle service, access to a competition golf course and fully equipped spa are just several of the services guests will receive with the all-inclusive offer. Elegance and luxury await you in the 5-star Blue Diamond Luxury Boutique Hotel. Experience the magical wonders of the Riviera Maya! Relax in the tranquility of one of the 128 unique suites in the 5-star Blue Diamonds Luxury Boutique Hotel. The mix of limestone, wood and luxury amenities create a lavish fusion with the natural surroundings. Each suite opens up to spacious balconies or terraces, while also offering floor-to-ceiling windows and free Wi-Fi among a wide variety of other deluxe amenities. Decorated ceilings and bamboo floors highlight the tasteful interior of the Patio Junior Suite. This exquisite suite overlooks the lush gardens and meandering river waterways from the comfort of your own private patio equipped with an outdoor bathtub. With 1 king bed or 2 double beds, this suite intertwines luxury and exclusivity. Blending an elegant interior with the natural harmony of the natural surroundings, the Cenote Laguna Deluxe Junior Suite features breathtaking views of the mystical Mayan cenote or the peaceful laguna. Opening up to a spacious balcony or terrace, and offering a king size bed, this suite is ideal for a romantic getaway with that special someone. Suspended over the lagoon, the Palafitos Junior Suite provides relaxing sunset views from the large private sun deck or roof top terrace. Melding tranquility and luxury, each suite boasts a 4-post king size bed, private outdoor bathtub and spacious bathroom with a rain effect shower. The Patio Suites are a haven of privacy and indulgence, featuring a private pool on the terrace in addition to a private outdoor marble bathtub. Overlooking the mystical river waterways, each suite offers a king size bed, private living room and bathroom equipped with two rain effect showers. Uninterrupted views of the Caribbean define the Beach Front Casitas and their spectacular location on the sands of the Mayan Coast. Featuring private terraces overlooking the beach, direct beach access and an interior steeped in luxury, these casitas are ideal for a romantic getaway. The most exquisite suite available, the Beach Front Presidential Suite features three bedrooms with private bathrooms. Set amongst the stunning views and soft sands of the Caribbean, this suite also offers a dining room, kitchenette and a spacious living room, each of which is defined by unique character and elegance. Discover the elegance and luxury of the Blue Diamond Luxury Boutique Hotel through our photo gallery. 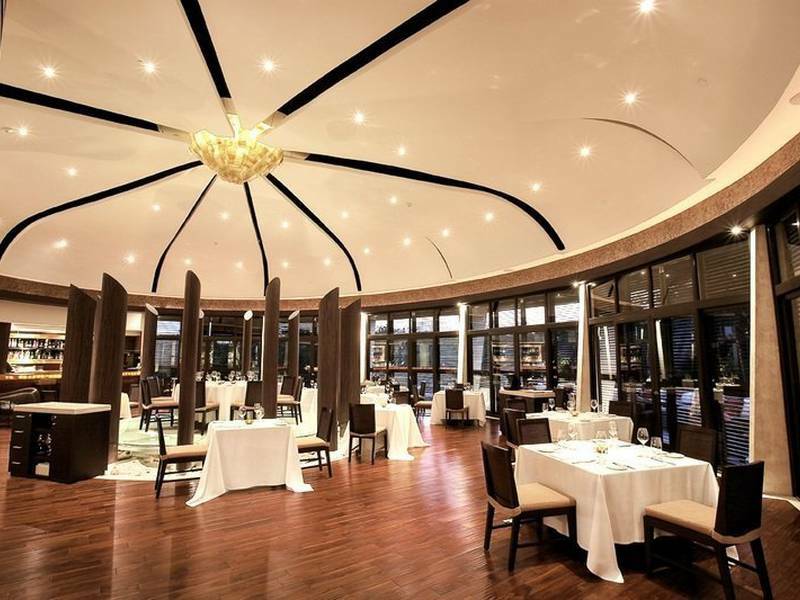 Immerse yourself in the myriad of images reflecting the true beauty and nature of this spectacular 5-star hotel. Explore what awaits you in this tropical Caribbean paradise. Take advantage the exclusive promotions available at the 5-star Blue Diamond Luxury Boutique Hotel here. We want to ensure your vacation is defined by luxury and elegance at a price which you deserve. Book your vacation to the Maya Riviera here, on the hotel’s official website. The best offers on the official website only! The breathtaking surroundings and elegant suites are only part of what defines the 5-star Blue Diamond Luxury Boutique Hotel. This all-inclusive, adult only hotel combines the beauty of the natural setting with the lavishness of world-class services like our fully-equipped spa. Steeped in exclusivity, guests will also have access to a competition golf course, palm filled white sandy beach and a wide selection of exclusive restaurants. Enjoy our airport shuttle service, free Wi-Fi and numerous sporting activities and you’ll experience a truly magical vacation in the mystery of the Riviera Maya. The exclusive location of the Blue Diamond Luxury Boutique Hotel adds to the allure of this 5-star adults only hotel in the Riviera Maya. Situated just ten minutes from the enchanting city of Playa del Carmen and 30 minutes from the Cancun International Airport, the secluded hotel is easily accessible. Also nearby are the archaeological eco-park of Xcaret and the aquatic eco-park of Xel-Ha. Km. 298-816, Carretera Federal 307 Chetumal-Puerto Juárez. Playa del Carmen, México. Providing world-class service is our priority, and below you can find all the necessary contact information for any queries or concerns you may have. We are here to help ensure you have the most exclusive, luxurious and memorable vacation possible, so please don’t hesitate to contact us. You may avoid downloading of cookies through your browser’s settings preventing cookies to be stored in your device. As the owner of this website, BLUEBAY HOTELS informs you that we do not use any personal information coming from cookies, we only draft general statistics on visits which do not carry any personally identifiable information. It is very important to read this cookies policy for you to understand that if you continue to use our website, we shall consider you agree their use. According to the provisions stated in article 22.2 of the Act 34/2002 on Services of the Information Society and Electronic Commerce, if you continue to use our website, you will be giving your consent to the use of the referred instruments. The entity responsible for the collection, processing and use of your personal data in the terms set out by the Personal Data Protection Act is BLUEBAY INTERNATIONAL DMCC. Cookies are little data stored in text files which are store in your computer or other device when websites are viewed on a browser. They are widely used to “remember” you and your preferences, either for a one-time visit (through a “session cookie”) or for manifold repeated visits (using a “persistent cookie”). They ensure a consistent and efficient experience for visitors and carry out fundamental actions such as allowing users to sign up and keep them connected. Cookies may be established at the site you are visiting (known as “origin cookies”) or at other websites which publish contents on this site (“third parties’ cookies”). Many of the cookies we use are only set if a visitor is a registered user, while others are established for all visitors in certain occasions. _ga: tracking the user´s activity on the site. PHPSESSID: Tracking of user´s session. Please find below a description of each cookies category in use, with illustrative examples (including those used both for registered and non-registered users). These cookies which are essential for the website to display its basic functions. These include those necessary to allow registered users to authenticate and carry out activities related to their account, as well as to store the on-line “charts” content which have an electronic commerce functionality. •	PHPSESSID: Necessary for the storage of the user´s session identification and through this the right user´s navigation on the website. •	PHPSESSID / bluebayweb: Language selected by user, specific campaigns selected by user and details on the user’s booking. Performance cookies collect information on how users interact with the websites, including which pages are the most visited, as well as other analytical data. These data are only used to upgrade the operation of a website. gat_UA-30207882-1: User´s behaviour on the site. These cookies are used to display relevant advertising to visitors, as well as tracking the quantity of visitors. They do a tracking on the visitors’ data, such as the number of single visitors, the amount of times certain ads have been displayed, the amount of clicks having been received and they are also used to measure the effectiveness of advertising campaigns creating users’ profiles. These are established by automatic and trustworthy networks by third parties and, in general, their persistent cookies. The websites use different third parties’ applications and services to improve the visitors’ experience on the website. These include social media platforms such as Facebook and Twitter (through the use of share buttons), or embedded Youtube or Vimeo contents. As a result, cookies may be established by these third parties and used by them to track your on-line activity. We do not have a direct control over the information collected by these cookies. To get further information on how to administer and delete cookies, please visit aboutcookies.org. To get more details on advertising cookies and how to administer them, please visit youronlinechoices.eu (in te EU) or aboutads.info (in the USA). It is important to take into account that the restriction or turning off of cookies may limit the functionality of the websites or prevent them from working properly. Both websites and HTML e-mails may also contain other tracking technologies, such as “web beacons”. These are typically small transparent images which provide statistics for similar cookies as those of cookies. They are often used with cookies, although they are not stored in the same way. As a result, if cookies are turned off, web beacons may be still loaded, but their functionality will be restricted. On this area, the USER will find all the information concerning the legal terms and conditions regulating the relationships between our users and us who are in charge of this website. As a user, it is important for you to know these terms and conditions before you continue to use our website. BLUEBAY HOTELS, liable for this website makes the commitment to process the information of our users and customers with full guarantees and comply with the national and European requirements regulating the collection and use of personal data of our users. This website therefore thoroughly complies with the GRDP (EU REGULATION 2016/679 on personal data) and the LSSI-CE the Act 34/2002, June 11 on services of the information society and electronic commerce. These General Terms govern the use (including mere access) of the web pages making part of the BLUEBAY HOTELS website including contents and services made available therein. Every person getting access to the BLUEBAY HOTELS website (“User”) consent to be subject to the General Terms in force at any time. Users are informed and they agree that the access to this website does not imply, under any circumstance, the start of a commercial relation with bluebayresorts.com. This way, users commit themselves to use this website, its services and contents without infringing the effective legislation, good faith and public order. The use of the website is forbidden if with illegal or detrimental purposes, or under any other form which may cause damages or prevent the website from operating properly. Concerning the contents of this website, it is forbidden: (i) the total or partial reproduction, distribution, or modification, unless this is authorised by their legitimate owners; (ii) any violation of rights of the provider or their legitimate owners; and (iii) its use for commercial or advertising purposes. When using the website, BLUEBAY HOTELS, Users commit themselves not to follow any conduct leading to damage the image, the interests, and the rights of BLUEBAY HOTELS or those of third parties or which may damage, render unusable or overload the bluebayresorts.com portal or hampering in any way the normal functioning of the website. However, Users must be aware that security measures of IT systems on the Internet are not fully reliable and that, therefore, BLUEBAY HOTELS cannot fully guarantee the absence of viruses or other elements which may cause alterations in IT systems - software and hardware - of the Users or in their electronic documents and files included therein. The personal data provided by Users to bluebayresorts.com may be stored or not in automate databases, the ownership of which fully belongs to bluebayresorts.com, this taking over all the technical, organisational and security measures to guarantee confidentiality, integrity and quality of the information included in these, according to the provisions set out in the applicable data protection regulations. Communication between Users and bluebayresorts.com uses a secure channel and the transferred data are encrypted through https protocols, therefore, we guarantee the best security conditions for assuring Users’ confidentiality. BLUEBAY HOTELS informs that there are claim forms available for users and customers. Users may file claims requesting a claim form or sending an e-mail to info@grupobluebay.com stating first and last names, the purchased service and/or product and detailing the reasons for his/her claim. According to the provisions set out in articles 8 and 32.1, paragraph 2, of the Intellectual Property Act the reproduction, the distribution and the public communication are expressly forbidden, including the modality of making available the whole or in part of the contents of this website, with commercial purposes, under any support or by any technical means, without the authorisation of bluebayresorts.com Users commit themselves to respect the Intellectual and Industrial Property rights held by BLUEBAY HOTELS. Users know and accept that the whole of the website, including not only but also the text, software, contents (including structure, selection, layout and presentation of those) podcast, pictures, audio and video materials and graphics is protected by trademarks, author’s rights and other legitimate rights, according to international treaties in which Spain takes part and other property rights and acts of Spain. In the event that a user or a third party considers a violation has been recorded against their legitimate intellectual property rights due to the introduction of certain content in the website, this extent shall be notified to BLUEBAY HOTELS specifying: (i) personal data of the holder of the rights which have presumably being infringed, or the representation s/he holds in case the claim is filed by third party representing the holder; and (ii) the contents protected by intellectual property rights and its location on the website, the certification of the stated intellectual property rights and the sworn statement in which the holder takes responsibility for the truthfulness of the information provided in the notice. The pages of the bluebayresorts.com website could provide links to other websites and contents which are owned by third parties. The only object of the links is to provide the User the chance to access these links. However, BLUEBAY HOTELS is not liable, under any circumstance, of the results which may arise for the User in case s/he gets access to these links. Furthermore, the User on this site will find pages, promotions, membership programmes getting access to the users’ navigation conducts to establish profiles. This information is always anonymous and does not carry personal identifiable details. Users intending to establish any technical device linking their website to the bluebayresorts.com website shall get prior authorisation in writing on the side of BLUEBAY HOTELS. In any case, the establishing of this link shall imply the existence of relationships between bluebayresorts.com and the site’s owner, or the acceptance or approval by BLUEBAY HOTELS of its contents or services. On our website, comments are allowed to enrich contents and make consultations. Comments nor related to the scope of the website will not be allowed, either, those including libels, affronts, insults, personal attacks or rude comments in general towards the author or other members. They will also be erased those comments containing information which is clearly misleading or false, as well as comments including personal data, such as, private address or telephones and infringing our data protection policy. Also those comments added only with commercial purposes of a website, person or group will be rejected and everything which could be considered as spam in general terms. Anonymous comments are not allowed, as well as those made by a same person under different nicknames. Comments intending to force a discussion or the taking of a position by another user will not be considered either. BLUEBAY HOTELS does not assure any guarantee or is not responsible, under no circumstance, for damages of any kind which might arise of: (i) lack of availability, maintenance and effective operation of the website, its services and contents; (ii) the existence of viruses, malware or damaging programmes in contents; (iii) the illegal, negligent, fraudulent or opposite use of this Disclaimer; (iv) the lack of legality, quality, reliability, usefulness and availability of services provided by third parties made available to the website’s users. BLUEBAY HOTELS under no circumstance is responsible for the damages which might arise of the illegal or wrongful use of this website. In general terms, the relationships between the bluebayresorts.com holder and the Users of its on-line services, included in this website are subject to the Spanish legislation and jurisdiction and to the Courts of Malaga. In case that any user has doubts on these Legal Terms or any other comment on the bluebayresorts.com website, please contact info@grupobluebay.com. On behalf of the team making part of BLUEBAY HOTELS we thank you the time spent in reading this Disclaimer. This Disclaimer has been updated on May 21st, 2018. The bluebaydiamondluxuryboutique.bluebayhotels.net website is owned by BLUEBAY HOTELS, company incorporated in Dubai, United Arab Emirates. We welcome you to our website and we thank you stay with us. On this website (bluebaydiamondluxuryboutique.bluebayhotels.net), an ongoing commitment is taken with regards to the personal data of subscribers, contacts, customers and the best practices are guaranteed as far as the use of personal data is concerned. BLUEBAY HOTELS opposes the sending of non-requested e-mails (spam), making every effort to avoid the wrongful use of the e-mail. Also all users of this website are informed that users’ data got through this portal will never and under no circumstance be shared or transferred to third parties unless they have been previously informed and they express their clear authorisation. The platform could include links to third parties’ websites. If so, in any case, we will be responsible for the data protection practices or the contents of these websites. Consequently, it is recommended to carefully read the privacy policies for each website before accepting the terms and continue to use it. Bluebayresorts.com is hosted in the Data Centre by Cybermundi, S.L., GLOBAL OBI, S.L.U (ROIBACK, hereinafter), CLOUD HOSPITALITY SERVICES, S.L. and BD TRAVELSOLUTION, responsible for the users’ data which are included and processed wth the aim of answering questions, providing services requested through the contact form, implementing the service hired by the user and managing the invoicing and collection of payment, managing the registration process of the user in the portal, moderating comments and managing the subscribers list of this website (sending newsletters). Corporate name is BLUEBAY INTERNATIONAL DMCC. Address: DMCC Business Centre, Level 1, Jewellery & Gemplex 3, Dubai, United Arab Emirates; incorporated according to the United Arab Emirates legislation, on June 15th 2016 and registed in the Registry of Companies of Dubai under the entry DMCC60581 and with the VAT No. N6471190F. The corporate object is: Everything related to construction, sale, exploitation, transfer and administration and the active and passive rental of hotels, villas, bars, premises and furniture related to hospitality, on their own or on behalf of third parties and, in general, the carrying out of any hospitality activity. The sending of personal data is mandatory to get in touch and carry out commercial transactions with bluebayresorts.com. Also, the lack of provision of the personal data or the lack of acceptance of this data protection policy implies the impossibility to subscribe and process the requests made in this portal, as well as the impossibility to carry out the relevant purchasing. The cases in which this website requires personal data are: (I) sign up for the newsletter by bluebayresorts.com; (ii) gather the necessary data to confirm the booking; (iii) ask for quotations; (iv) make consultations through the contact form; (v) request any of the services and/or products we provide. •	(i) To promote services by bluebayresorts.com. For example, if the User leave personal information in one of the contact forms, BLUBBAY HOTELS may use these data to send him/her information on their services in the case this is requested. •	(ii) To manage the subscriptions list, send newsletters, promotions and special offers. •	(iii) To manage the sale of our products. •	(v) For customer service and to provide follow-up services. •	(vi) To get in touch with subscribers and users. In every case, as a User you will have full rights over your personal data and over the use of these and may exercise them at any time. In any case, we will be transferring data to third parties without you being informed and ask you for your consent. In order to provide strictly necessary services to develop our activity, we share data with the following providers under their respective privacy terms. All the features provided by third parties are strictly necessary for developing our services and have been selected taking into consideration the compliance of the rights we protect in this website. The following companies will have access to the necessary personal information to carry out their activities, but they will not be able to use it for other purposes. Furthermore, they will have to process personal information in compliance with this Privacy Notice and the applicable legislation on data protection. Hosting: Cybermundi, S.L., GLOBAL OBI, S.L.U (ROIBACK, hereinafter), CLOUD HOSPITALITY SERVICES, S.L. and BD TRAVELSOLUTION. Messenger services and sending newsletters: Mailchimp of the company The Rocket Science Group LLC d/b/a MailChimp, a State of Georgia limited liability company. This company is located in the USA. An Agreement between the EU and the USA has been recently signed named after Privacy Shield and all the companies under this Agreement have an adequate protection, consequently, the international data transfer is allowed. Mailchimp is subject to the privacy shield, so it complies with the security measures imposed by the European legislation. Therefore, the user is aware and accepts that his/her personal data will be stored by Mailchimp for the singing up and the sending of electronic newsletters. This website uses different systems for personal information capture, always requiring previous consent byt he users before processing personal data with the stated purposes. As a User you have the right to withdraw your consent in any moment. •	(i) Contents subscription forms: on the web, there are several forms to encourage subscription. If you use spam filters, please add my e-mail service to your list of authorised senders. In every case in which you send me data through any of the web subscription forms, we will verify your e-mail address through a verification system. Look up in your inbox. You will receive an e-mail sent from the address newsletter@grupobluebay.com with the subject “Confirm your sign-up to bluebayresorts.com”. You will have to confirm your subscription for us to validate your e-mail address. We will use the provided data to send you the newsletter. BLUEBAY HOTELS does not store e-mail addresses which have not been verified. The newsletter is managed through the marketing e-mail tool Mailchimp. •	(ii) Comments form: the website includes a form to make comments for the posted posts. As a User you may post comments on the posted posts. The personal data entered into the form to make these comments will be exclusively used for moderation and posting purposes. •	(iii) Contact form: there is also a contact form for consultations, suggestions or professional contact. In this case, the e-mail address will be used to answer these questions and send the information the user has requested through the web. The Users may cancel registration to the services provided by bluebayresorts.com any time through the newsletter itself. •	(i) From the time of the subscription, BLUEBAY HOTELS has access to: The username and e-mail address. •	(ii) The User guarantees that the provided personal data through different forms are true, being obliged to notify any modification of those. •	(iii) Also, the User guarantees that all the provided information concerns his/her actual situation, that is updated and it is accurate. •	(iv) Furthermore, the User is obliged to always keep his/her data updated, being the sole responsible for the inaccuracy or falseness of the provided data and the damages this may cause to BLUEBAY HOTELS as the owner of the bluebayresorts.com website or to third parties when using these data. On this website, we can also get your data through the customer form, for which we need your full data, such as full name, shipment address, if relevant, in order to send you the documents. Be aware that shipments are made by transport agencies to which your data will be transferred so that they can provide the transport service. The user may address his/her notifications and exercise his/her ARCO rights following the requirements set out in the Framework Law 15/1999, December 13 on Personal Data Protection and its Implementation Regulation. BLUEBAY HOTELS reserves the right to modify this policy to make it conform to regulatory or case updates, as well as the practices of the sector. In these cases, BLUEBAY HOTELS will post on this page the changes with a reasonable period of time in advance from the implementation of these. According to the LSSICE, BLUEBAY HOTELS does not implement SPAM practices, so it does not send commercial e-mails which have not been previously requested or authorised by the User. Consequently, in every form available on the website, the User has the chance to give his/her express consent to receive the “newsletter”, regardless of the commercial information which s/he has requested.